For earring swaps, I almost always try to learn a new technique. I don't know why I put some poor stranger through my learning curve, but I do. I guess I enjoy being surprised as much as they do. This time, I wanted to try my hand at seed beading - something that I do VERY rarely, but really love the look of. These earrings are inspired by the work of Miguel Ases. I don't think his patterns are as unique as his use of color - but a 'real' seed beader would probably be a better judge of that than me. newbie mistakes that I wish I could have fixed - but we all know that it adds to the charm of a handmade item - right? If you're wondering what goofs I made, I accidentally picked up a different bead in the outside dark edge of one of the earrings - very minor and barely noticeable. But more noticeable, if you know about it, is the fact that the two crystals on the top of each of the earrings are actually different colors - or maybe they have different coatings. I use crystals about as frequently as seed beads - so I'm not sure. The bottom line is that one of the crystals has a blueish sparkle and the other has a greenish sheen. I thought it was just the light, but it wasn't... They are two different beads that were mixed in the same container. Another first for me on these earrings is that it was the first time that I ever made a pair of clip on earrings. It was a bit of a design challenge for me. I had many pairs of clip findings that I bought in a mixed bag of findings ages ago - so I thought it would be no big deal - but it was! 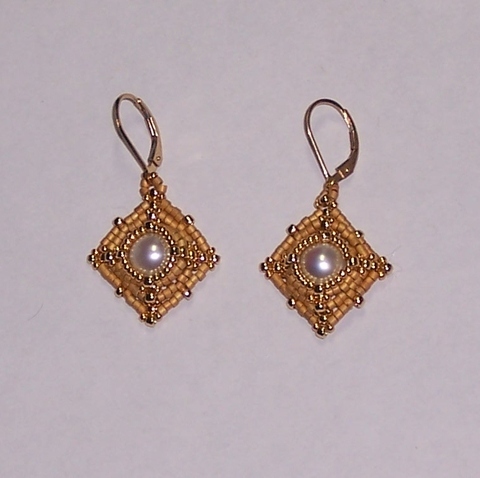 They dangle differently, and they often have a large bead on the front of the finding - which is hard to design around. In the end, I ending up with these simple hooks and used the chain to make the earrings dangle and swing. This swap was through Beadingaholics - it is a yahoo group. I think it is mainly seed beaders, but there are also discussions about chain mail, wire wrap and anything beading or jewelry related. My swap partner was Jane Bartek from Poughkeepsie, NY. She doesn't have a big online presence, so I can't provide links to her work, but this picture is the earrings she made for me. They are very pretty. What you can't see in the picture is that they are very 3-dimensional and form a pyramid at the center. It gives them more depth . I enjoy wearing them and they go with everything. First attempt? Those are awesome! I wouldn't even know where to begin. I'm sorting my seed beads now, and I need to do something with them. Haven't touched them in over a year! You are so sweet! I saw your seed bead sorting and I am envious of your collection - so many colors! I am trying not to start another bead collection, so I have been working off what they have available at the local Michael's... It's not as diverse. I'm in your group. I love that you changed the theme. I didn't do it this year because of the theme. BOTH earrings are beautiful. Thank you! I agree, the theme was a tough one, but the people who did follow the theme did a really nice job. I couldn't think outside of the box on that one - all the Grinch reminded me of was furry and green. I admire his earrings too. Yours turned out really beautiful! Did you have a pattern? I'm not sure where to begin. No, I didn't have a pattern. It is fairly simple brick stitch. I learned the brick stitch from a beadaholique video at this link: http://www.youtube.com/watch?v=66srPd6V_Qw The center is a larger hole bead and after weaving the brick stitch, I glue a flat back crystal over the hole. The first one I tried I used much larger beads to figure out the pattern and layout. I love these, I can not seem to figure out how you bead around the medium bead with the brick stich. I'm talking about the earring with what looks like a clip on earring component.